Low sensitivity transmitter of photocurrent to 4-20mA current loop. Transmitter (current amplifier) with output current of 4-20 mA, for including photodiodes in an industrial 4-20 mA data bus. The AMPCON converts a photocurrent into an output current between 4 and 20mA. The module is designed for integration into 4-20mA data buses. 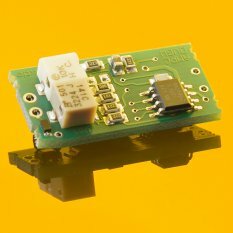 The present module works with a low gain factor and converts a photocurrent of 250μA (adjustable +/-35%) to an output of 20mA. This means, a current higher than 250μA will cause saturation. Other modules with medium gain (AMPCON_MED, up to 2,5μA) and high gain (AMPCON_HI, up to 18nA) are available. Alternatively, please refer to the below instruction for changing the gain.